Sitting here this morning I realized something. I enjoy coffee and cigars together as much if not more than beer, wine, or whiskey and cigars. 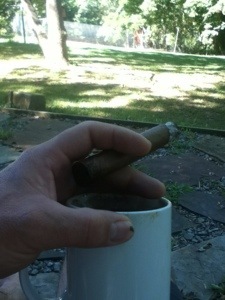 Don’t get me wrong I love a good spicy cigar with the bite of a nice rye whiskey, but there isn’t a bad cigar / coffee paring. To me and my rather novice taste buds they just seem to perfectly compliment each other. 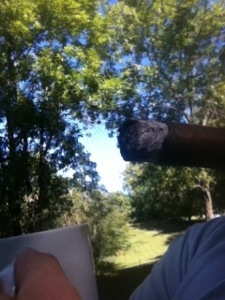 Weather it be a dark heavy oily maduro or a lighter Sumatra, coffee just seems to meld with them perfectly. The roastiness, oiliness, bitterness, and toasty flavors of coffee just compliment and or contrast a cigar for the perfect blend of flavor happiness in your mouth. I am also a firm believer that ambiance is about 75% of the flavor experience. So the fact that today I’m sitting on my patio on a perfect early fall day, the first day of fall to be precise. The leaves still green but starting to turn. Relaxing with Eric Clapton softly playing in the background. I’m watching my chickens peck and play doing the comical stuff chickens do. The cool breeze blowing and warm sun shining doing the perfect balancing act just like my, nothing special national brand coffee and Tatuaje series P are performing with one another. Has a huge impact on what a wonderful experience this is. 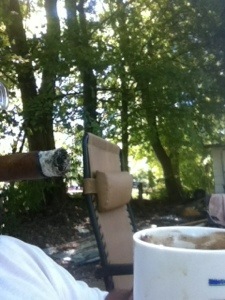 As I finish my cigar down to the final nub and let the last drink of coffee finish their last dance on my tongue. I urge you if you are a cigar smoker and have never done it before grab your favorite coffee cup, pour a nice hot cup of joe, toast a quality cigar and relax. Take in the day and all the little specialities it has to offer. Perfect first day of fall.